Anne Hanks of Rathvilly, Ireland recently experienced a Sudden Cardiac Arrest (SCA) while at home. Within minutes of Hanks collapsing and losing consciousness, her son-in-law and neighbor began cardiopulmonary resuscitation (CPR) while her daughter ran to the nearby GAA (Gaelic Athletic Association) Club to retrieve its HeartSine Automated External Defibrillator (AED). Soon after, Hanks’ daughter returned with the defibrillator and the club’s physiotherapist. Fortunately, due to the use of the AED and continuous CPR, Hanks was able to stay alive until the ambulance arrived and took over. “She was just so lucky that the right people were there at the right time,” praised Sophie Kelly, Rathvilly GAA’s health and wellbeing officer. “It’s such a good news story of how they saved a life and how having the defibrillator is just so important in a community,” she added. Hanks’ life was saved due to the quick thinking of her son-in-law, neighbor, and daughter, and thanks to CPR and the use of a lifesaving HeartSine AED. Shortly after the incident, Hanks was presented with an AED from HeartSine Distributor, Heart Safety Solutions, to donate to the charity or organization of her choice. 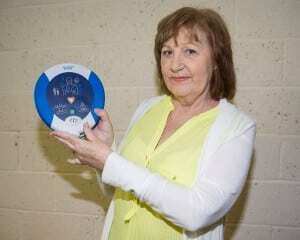 Hanks took advantage of HeartSine’s Forward Hearts Program and donated her AED to the Rathvilly GAA. HeartSine’s Forward Hearts program allows survivors of an SCA event, in which a HeartSine defibrillator has been used, to potentially save another life by donating a HeartSine device to the charity or organization of the survivor’s choice. Read the full news features by clicking here and here.